Over spring break I managed to trudge my way through the first section of Michael Pollan’s The Botany of Desire. This is one of his pre-Omnivore’s Dilemma works, in which he examines the relationship between certain plant attributes and human desire. The first section is on apples. He promises in the introduction to show how humans have cultivated plants to maximize what we desire (in the case of the apple this would be sweetness.) However, I failed to see his point until the last four pages of the section. The bulk of the chapter was a drawn out love letter to Johnny Appleseed, who Pollan seems to have a giant man crush on. I got a little fed up to be honest. I mean, YES, I was infatuated with J. Seed in elementary school. The legend of a barefoot man running around the country with a pot on his head planting trees and petting bunnies was a direct mirror of my life’s aspirations. But I’ve kind of grown out of it. John Chapman wasn’t planing trees to feed people in good hearted charity; He was planting his own orchards to sell the trees to settlers so they could produce Applejack, a cider based liquor. He also didn’t travel the WHOLE country, as I had thought, but did cover quite a bit of ground (he managed to spread his seed through Connecticut, New York, Pennsylvania, Ohio, and Indiana). There are also some tales of a child-bride. Just throwing that one out there for you to google. This was all to say that sometimes I hate reading Pollan, and that Johnny Appleseed was a weird guy. Bon app y’all. 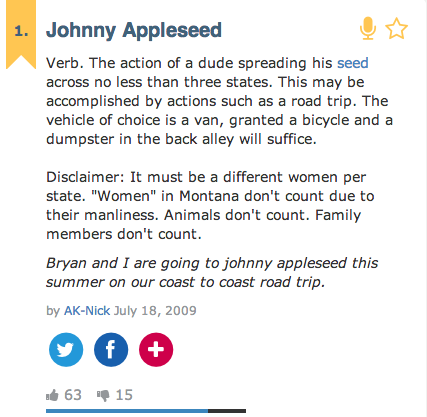 Also there is a definition for Johnny Appleseed on Urban Dictionary. IT MAKES ME SO HAPPY.